"Last.fm Scrobbler for Web Services" automatically scrobble music tracks on "Music" or "Entertainment" categories from popular web services like YouTube into the Last.fm. Automatic scrobbling takes place four minutes after the track is being played or at the end of the current track. You can manually scrobble tracks by clicking on the scrobble label placed on top of the player. This extension also integrates the love/unlove button to the player for easily mark a music track as loved or unloved. These set of extensions have no added toolbar button. Just open the web service like YouTube. As soon as a music video is played, you will get a label on top of the player. If the extension has no valid session key, a new page will open asking for integration. When integration is finished, automatic music scrobbling occurs. You will get info on the label inserted on top of the player as shown in the screenshot. What are the "Last.fm Scrobbler for" add-ons? These set of add-ons aim to bring highly integrated Last.fm scrobbling tool into the popular services like YouTube. Each add-on is optimized for a service. 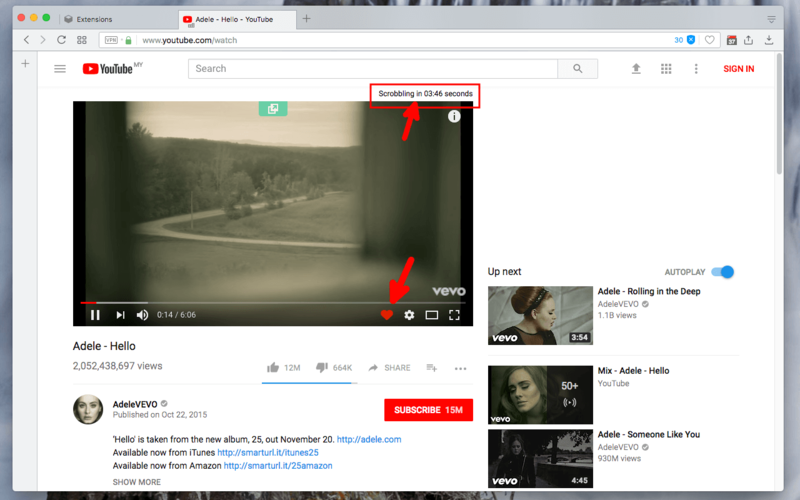 For instance, the YouTube scrobbler add-on respects Last.fm guide-line to scrobble only when a music track is played at least 4 minutes or at the end of the track. When music player is paused, the count down is also paused to prevent unwanted scrobblings. Also, the love/unlove button is integrated into the player (a button next to the settings button of the player). Note that manual scrobbling does not force the minimum 4 minutes of play. You can scrobble anytime by pressing the label. What are the online services that are supported by "Last.fm Scrobbler for" add-ons? At this moment, only YouTube is supported. I will keep optimizing the add-on for this web service for a while and if everything is fine we will have other popular services as well. Please add your service of interest in the review section to be considered for integration. Why don't I get the love button on some musics? Upon playing a music song, the extension validates the song. If this particular song is not found in the Last.fm database, the integration is detached and hence the love button is removed from the player (there is no point on marking a non indexed song as loved).